Abby Benedetto a Metro teacher at Saturday’s market. Much to their dismay, Horace Mann Middle School teachers discovered last week that when classes resume in the fall they will be sharing their campus on 23rd Street and Valencia with a five-year-old charter high school. Sanchez said he favored Metro’s project-based approach to education, but would not go against his staff’s plans to protest. He said there was room for both schools to co-exist. Horace Mann has about 330 students and Metro about 200. 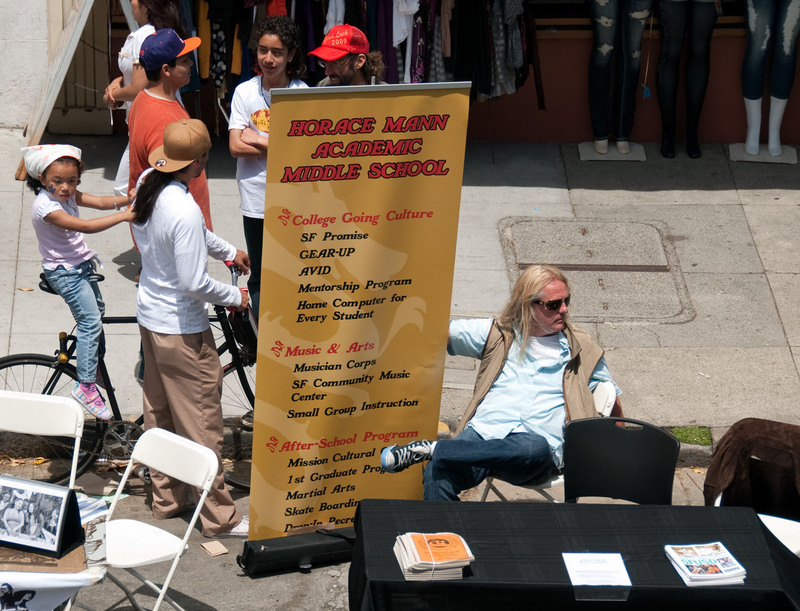 On Saturday, the two schools eyed one another from their respective booths at a community fundraiser for a proposed Mission District farmers market. They were the only two public schools at the fundraiser. Horace Mann's table at Saturday's community fundraiser. One teacher from Horace Mann said they discovered Metro’s move-in plans by chance last week when a parent from Metro told a teacher he knew at Horace Mann. Teachers and some parents had already made their opposition clear in April when the district first proposed the idea. “It’s not right,” the teacher said about the process in which the district simply makes a decision without consulting them. 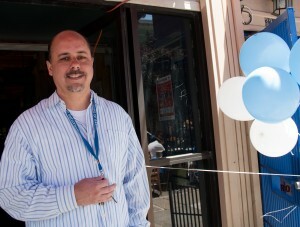 Mark Sanchez, principal of Horace Mann Middle School. Benedetto said Metro would gladly take any graduating eighth-graders from Horace Mann. “We represent a path for some of those marginalized kids,” she said. Some 91 percent of Metro’s graduating seniors were eligible to attend a California state university, and 95 percent plan to enroll in either a two- or four-year college in the fall. 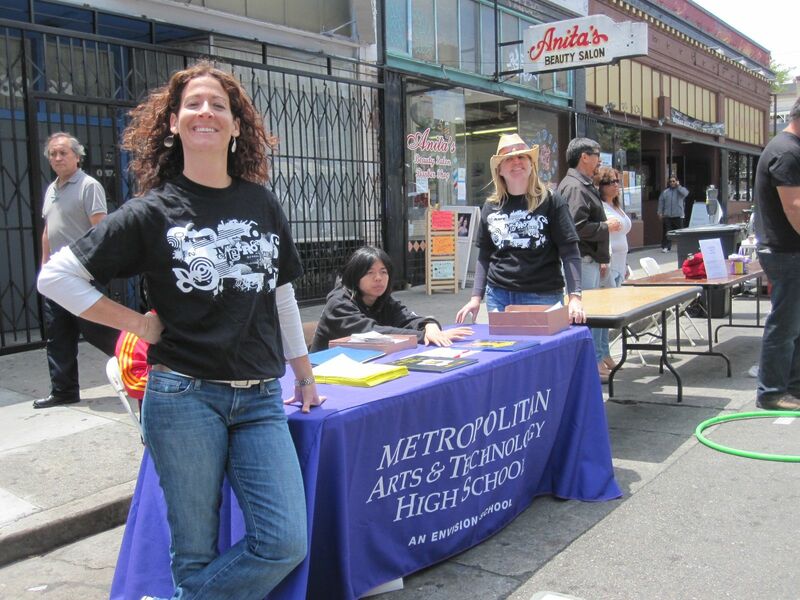 Metro, run by the nonprofit Envision Schools, opened in 2005 on Treat Avenue in the Mission District, moved to Fillmore and Jackson in 2007, and to Phillip and Sala Burton Academic High School in the Bayview District in 2008. Metro’s former principal Glenn Dennis, who was also at Saturday’s fundraiser, said the school had always planned to return to the Mission. Dennis, who will be an assistant principal in San Rafael next year, said that 50 percent of Metro’s students come from the Mission-Bernal corridor, and 70 percent are eligible for free or reduced lunch. “We’re project-based and about getting students ready for the 21st century,” he said. Metro saw Horace Mann as its best option because of its Mission District location and its dwindling enrollment. Proposition 39, approved by voters in November 2000, requires the district to provide facilities for charter schools. Horace Mann, built to hold some 600 students, now has about 330. It is on a state list of 10 struggling San Francisco schools and is planning major changes, including the introduction of project-based learning and a Spanish immersion program. Metro’s students would take over the eight classrooms in what is now known now as the sixth-grade annex, a separate building. They would also use five classrooms in the main building, Sanchez said. Metro is one of four charter high schools run by Envision, a nonprofit charter school operator founded in 2002 and based in San Francisco. It also operates City Arts and Technology High School in the Excelsior, Envision Academy in Oakland and Impact Academy in Hayward. It bothers me that the condition at Burton High (as described by Mr. Dennis) is apparently acceptable for the children at Burton, but not for charter school kids. If classrooms have no natural light, are leaking and are unpainted, then we need infrastructure repairs and replacements, not an easy-out for some children. @Atomic_Violin – I appreciate your concern and completely agree that infrastucture repairs and replacements are necessary. The availability of natural light was worse for Metro because the school occupied classrooms in the basement level of Burton. The Burton campus is built on a hill, so while the classrooms on the second and third floors have access to natural light, Metro’s interior classrooms, being against the hill, did not. I can’t speak for the leaks or need for paint but SFUSD maintains both the Burton and Horace Mann campuses so this move is not an “easy-out” for charter school children. Mission Loc@l consistently fails to ask tough questions about charter schools and instead falls for the hype, just like the mainstream press. Needless to say, Envision and all its spokespeople will claim oh, no, their kids all EARNED nothing lower than a C. Uh-huh. I think Metro teacher Abby Benedetto’s pose in the photo is kind of unfortunate – she looks smug, befitting an uninvited guest elbowing her way into a garden party, rather than looking like a sweet, well-meaning educator who just wants what’s best for the kids at Horace Mann AND Metro. Huh? I sense some animosity from some of the commentators. I’m missing how a pose is “smug..” All I see is a smile. I also don’t get the negative charter school ranting, but there it is. Part of the reason that public schools can’t move forward is the polarization of the all the various factions. It is easier to bash, and keep bashing until the offending party is a bloody mess. I guess it takes too much effort to cooperate and work together to improve the state of education, because someone might have to admit they are wrong. These are questions that deserve to be answered about charter schools, but only by the people who know the answers, not by heads of districts or organizations. Entertain for a moment the possibility that Envision is a successful educational model, and if you’re interested, look at some of the projects they have done and what is required for students to graduate. Included in graduation requirements are internships with local businesses, the creation and defense of an academic portfolio, and regular public presentations of projects where students defend their knowledge, skills, and growth. You should go sometime to one of these Exhibitions, talk to the teachers, and judge for yourselves whether or not students are being less challenged at Metro than traditional public schools. Students have left Metro in the past because they wanted to go to a school where they could get Ds and cruise through high school. Then consider the idea that anyone who is willing to put in the time and effort can run this model. Anyone who wants to see how it’s been done well and poorly can look at the history of the organization, instead of relying on the press, or on emotional and narrow arguments. Charter schools were never meant to stay charter schools, and they don’t want more money or privileges than other public schools. They’d like authentic and challenging, publicly accountable learning, and high standards to be the status quo. At issue is not the grading system at Metro. The issue is mixing HS students with MS students on the same campus. It’s just not an appropriate idea and shouldn’t be done, no matter what the HS. Think 6th graders vs. HS seniors and maybe you get the idea. Yes, I recognize that the grading system isn’t the issue. But Mission Local’s coverage was misleading in indicating that Metro has impressive success in sending graduates to college, when actually the school’s inflationary grading policy is the reason. So that still needed to be corrected. For what it’s worth: I also have reservations regarding high school students mixing with middle school students. NC= no credit, which is a failing grade so your statement about envision schools not giving a grade lower than a C is incorrect.